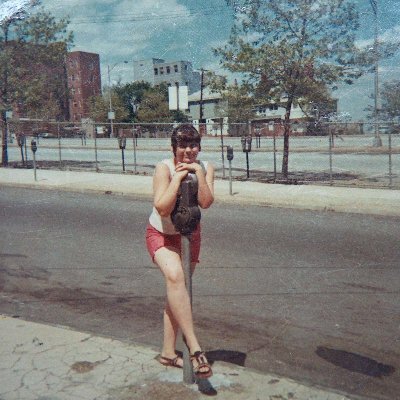 This is the start of a webpage which will feature my old photos of Staten Island. More will be posted whenever I can twist my husband's arm to scan them. 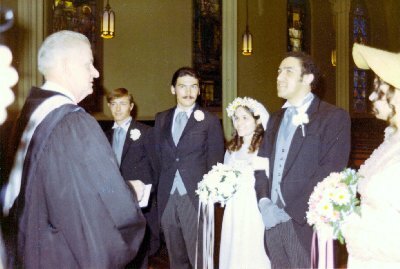 This page can be accessed via SIMemories.com or statenislandmemories.com. Click on this link to see pictures of the 2008 PS-16 reunion. 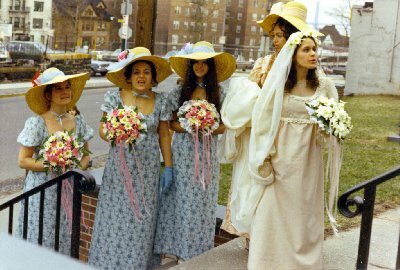 They begin with pictures at the schoolyard, where old classmates became reacquainted, then moved on to the reception at A Taste of Honey at Nansen Park. The photos below recall an outing my parents and I took to Stapleton Park in 1953. 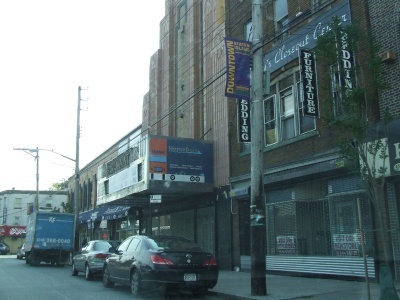 Many of the old businesses and shops can be seen along Bay Street and Water Street. An old bus can also be seen in the photos of my father and me. 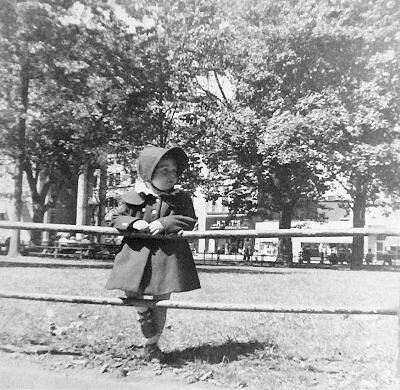 Back in those days, before television, computers and crime isolated people from each other, Stapleton Park was a popular place for Staten Islanders of all ages. Children could play safely, while senior citizens fed the pigeons and played checkers at cement tables. 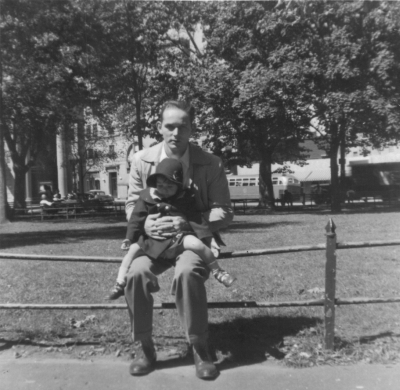 Like many people then, my family didn't own a car, so we either walked to the park or rode the 103 bus from our home at 120 Vanderbilt Avenue. Before heading back, we often enjoyed a hot dog or banana split at the lunch counter of the old 5 & 10. If you see anything that needs to be corrected, please e-mail me: flora(at)simemories.com. 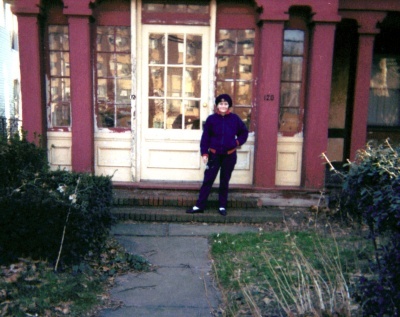 The photos above show my grandparents' former home in Clifton, at 120 Vanderbilt Avenue, as it looks today. When I grew up there during the 1950's, our front windows viewed a peaceful patch of woods across the street. The upstairs window in this photo reflects what is there today—the towering Vanderbilt Rehabilitation and Care Center. 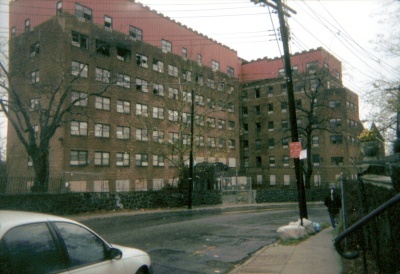 The Vanderbilt Nursing Home is more clearly reflected in the recent photo at left. Compare that with the trees and woods mirrored below. A window into the past can be seen in the photo at right, which reflects the woods and Staten Island's rural character of bygone days. 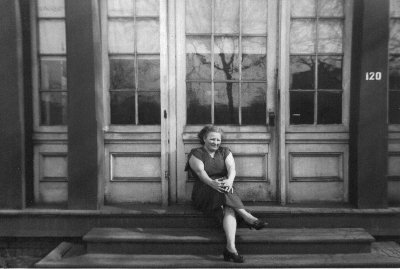 Taken about 1950, the picture shows my Aunt Louise who lived with my grandparents. Her smile welcomes us back to the past, just as her smile (and hugs) welcomed all who had the privilege of knowing her. In this life, everyone needs at least one Aunt Louise. 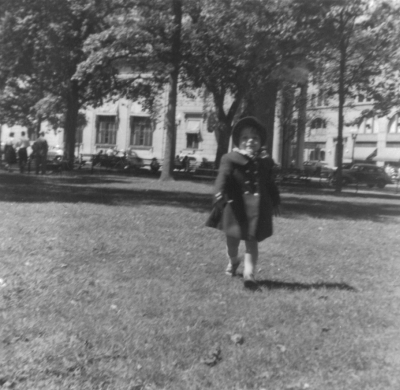 Yours truly on Vanderbilt Avenue in 1950. The background shows some of the peaceful woods that were once across the street. 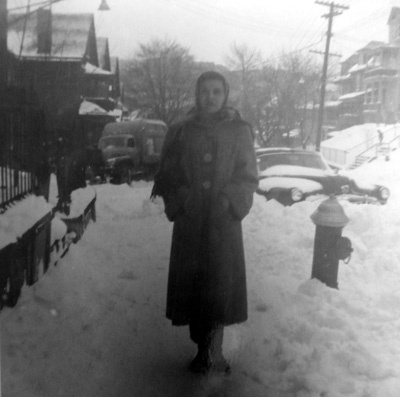 This photo (circa 1950) shows my mom standing in front of our home. The camera is looking toward Bay Street, a few blocks away. Note the complete absence of traffic on the road and only one car parked along the curb. Compare that to today when cars are bumper-to-bumper. My dad in the same location. 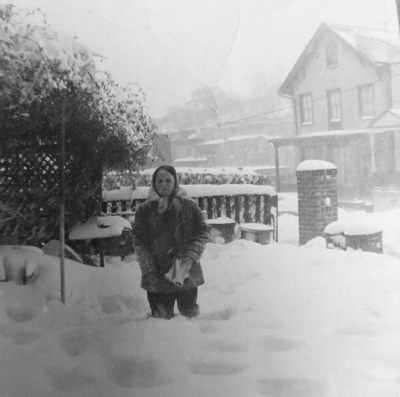 This photo, taken about 1954, shows me in our backyard. It also shows the now overgrown and blocked off dirt road behind the Vanderbilt Homes. Beyond the empty lot, Norwood Avenue and a couple of Victorian homes can be seen. 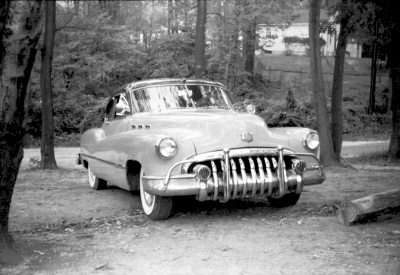 Dan's 1950 Buick Special. Note the spotlight. That was the height of cool. 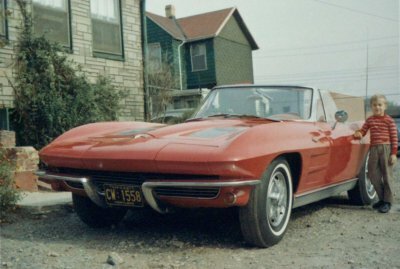 Dan's 1963 Corvette. He still has it and I think he will have to be buried in it. My friend, Debbie Tauriello, left, and me posing on Dan's Corvette trying to get his attention. Picture was taken at a Staten Island beach circa 1969. These two photos were taken about 1955. 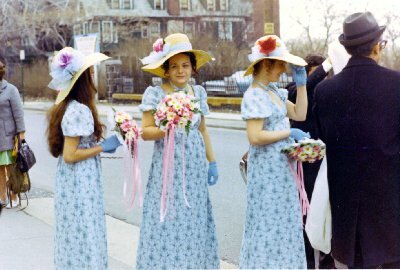 They show me and two friends dressed for church, maybe on Easter Sunday. In the photo below, I am in the center. I think the smallest girl is Patty Kelly (Dr. Kelly's daughter) and the tallest is Patty Katan. Behind us, the area across the street can be seen after the woods were bulldozed and the ground, leveled. It stayed that way for many years and neighborhood children would play in the empty space and on the hills surrounding it. In the background, familiar landmarks can be seen: The home for "The Aged Women of the Sea," (as it was called at the time) the Piels Brewery and part of the Marine Hospital. 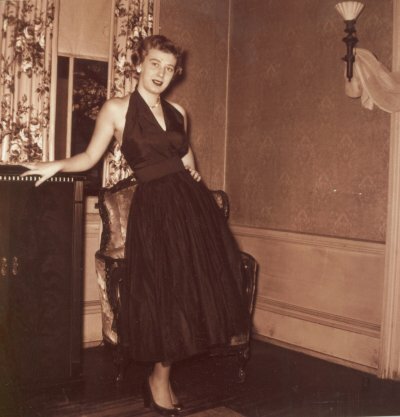 This photo of my aunt in that "little black dress," captures the glamor of the times. 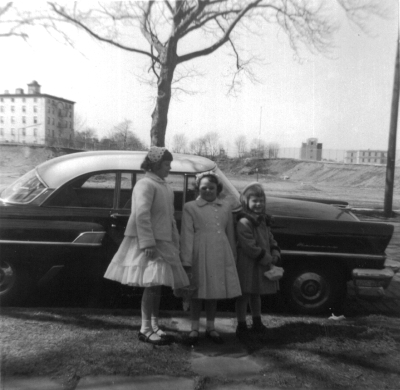 It was taken in the parlor of 120 Vanderbilt Ave.
My mother, right, with her sisters on the dirt road behind the Vanderbilt homes. The car appears to be a 1948 Chrysler. 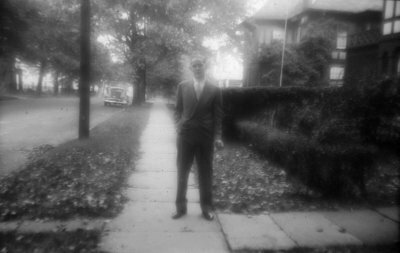 Yours truly on Westervelt Avenue in the mid 1950s. 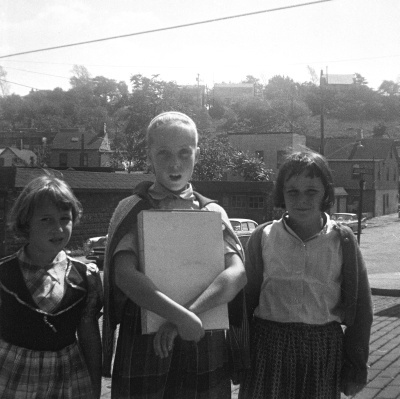 A group of neighborhood children whose names I can't recall, can be seen in the background. 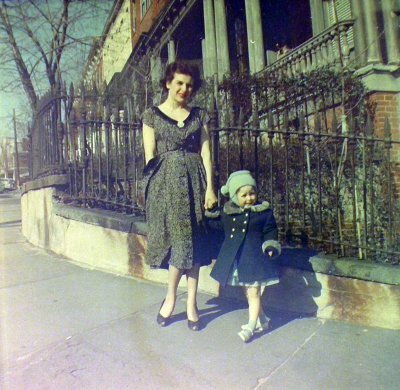 1953: My mom and I on the northeast corner of Westervelt and Corson Avenues. The apartments on Westervelt Avenue as they appeared after a fire gutted the first floor of the corner building (417), I'm glad that repairs have been made and that these beautiful old buildings are getting the tender, loving care they deserve. 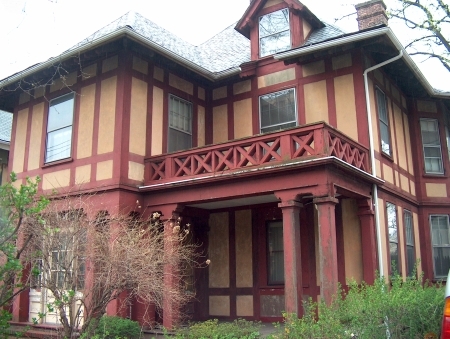 417 Westervelt Avenue after renovations. 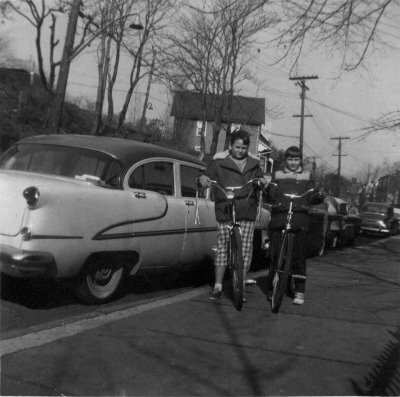 1959: A friend and I on Westervelt Avenue. 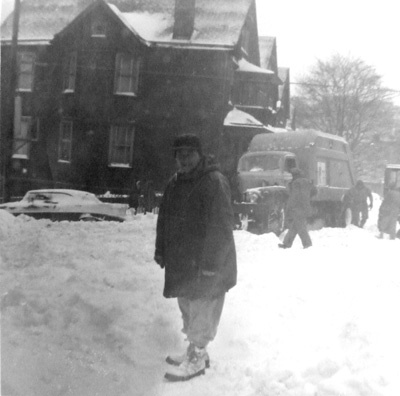 Yours truly after a heavy snowfall in the late 1950s. Notice the classic beauty of the house in the background. 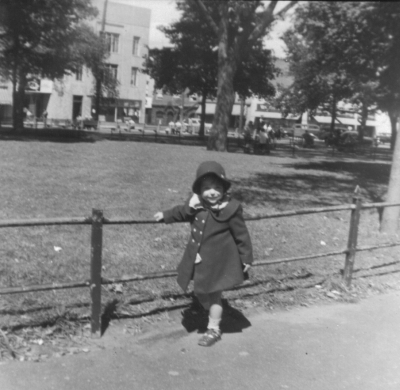 When I was growing up, the place seemed foreboding to neighborhood children. Rumor had it that after a pet dog died there, the owner had it stuffed and kept in the house. 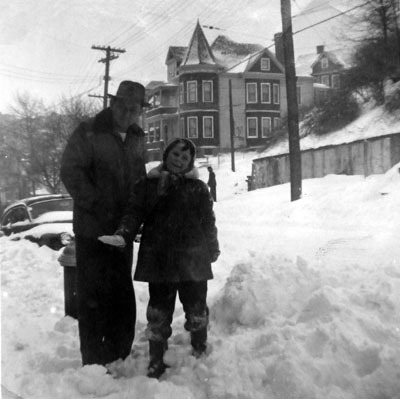 My father always shoveled the sidewalks after a snowfall. 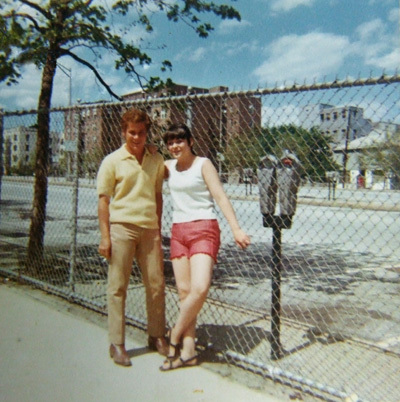 Here we pose together near the corner of Westervelt and Corson Avenues. 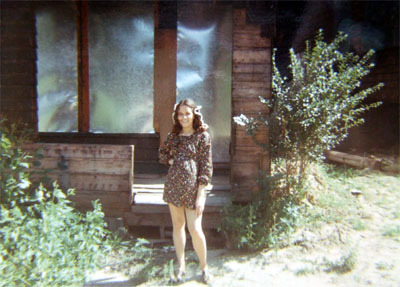 This photo shows a more complete view of the beautiful home in the background. 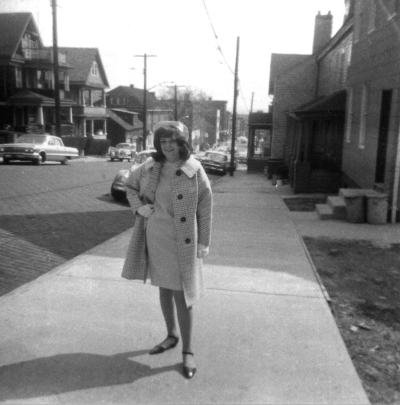 My mom near the corner of Westervelt and Corson. 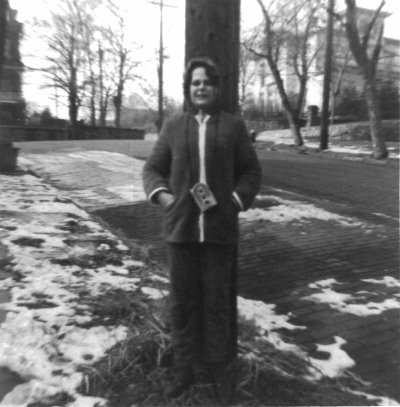 Unidentified man at the same location. 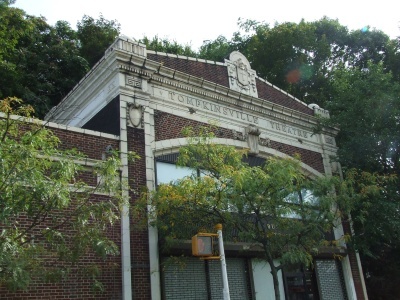 The building on the other side of Corson Ave. is 431 Westervelt. My mom and I once lived on the bottom floor. 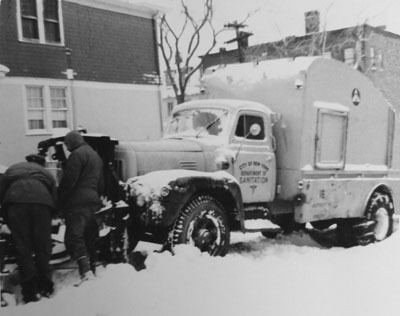 Sanitation workers and truck during the 1950s. Here I am on Benziger Avenue with Westervelt Avenue and a Victorian mansion in the background. 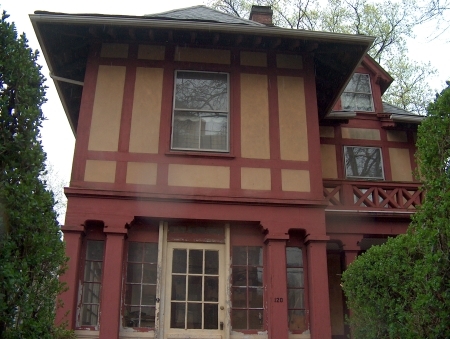 My late great-aunt said that Alice Roosevelt (Teddy Roosevelt's daughter) danced in the ballroom of that house. The place was abandoned when I lived in the area. Today the mansion is gone. 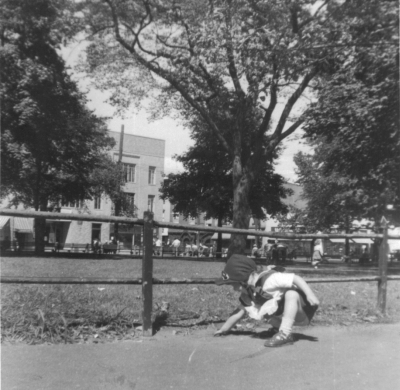 Westervelt Ave. on May 29, 1945. 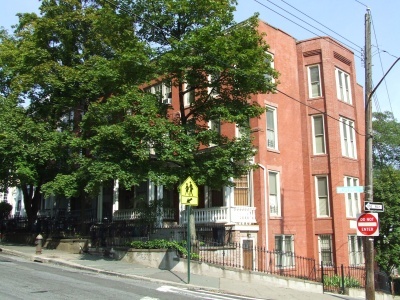 Her grandparents, Fred and Josephine Schutt, lived on the second floor more than 25 years. Photo courtesy of Dorothy Petersen Bradley. 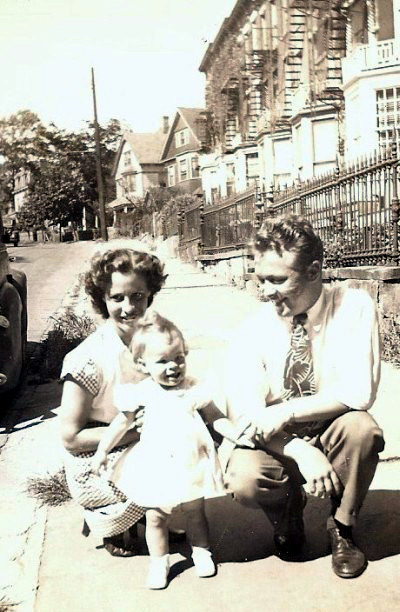 Dorothy Petersen with her mom and dad (Dorothy and Franklin Petersen) in front of 413 Westervelt Ave. on May 29, 1945. "I remember visiting the woman on the 3rd. floor above with my grandmother and her name was Bea. I believe the woman below was Mrs. Sussman but I'm not sure. I was very young. 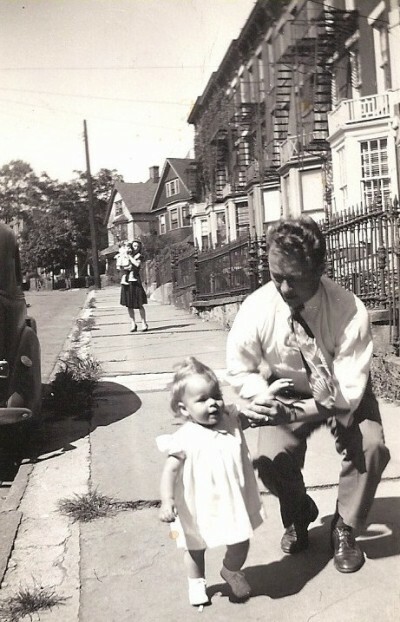 When I stayed over with my grandmother we always walked down the hill and went to see a movie at the Victory Theater ... this would have been in the late 40s and early 50s." 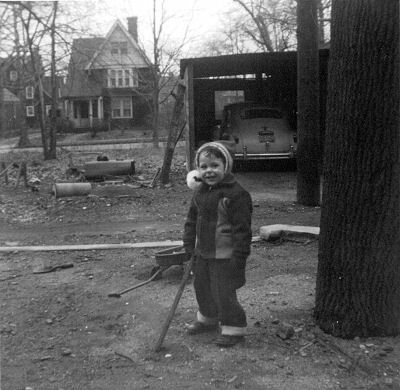 Me on Corson Avenue (near the corner of Westervelt) in 1953. 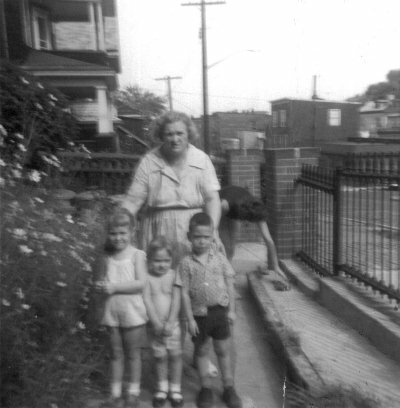 Taken in about 1960 this photo shows my late grandmother with my cousins. That's Corson Avenue to the right. 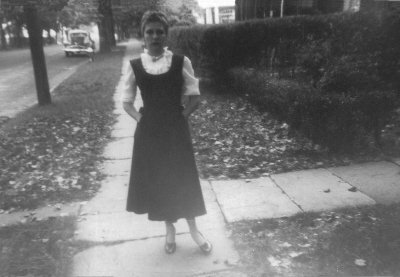 A friend on Corson Avenue in the late 1950s. 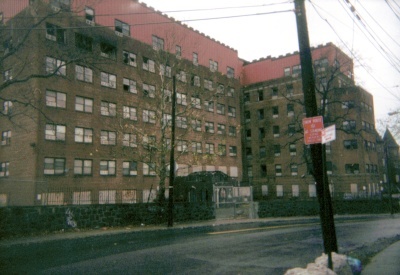 The apartments along Westervelt Avenue can be seen at the left. The photos to the left and below show Corson Ave. from the back yard of 417 Westervelt. 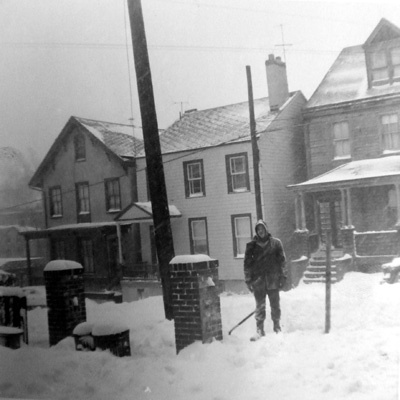 This photo taken in 1966 shows Corson Avenue down to Sherman Avenue and beyond. 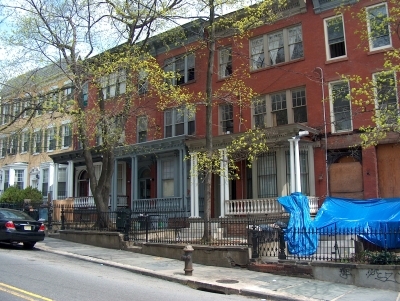 Past two taller homes on the left, a small store can be seen. It was closed by the 1950s. An older man, (Mr. Blindman?) would often sit outside. In the store window, he displayed photos of fish he had caught. 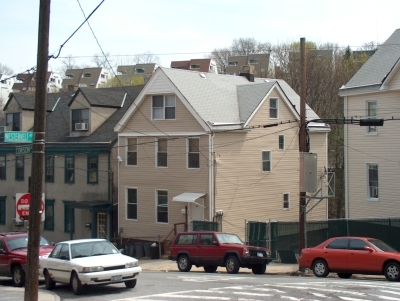 This photo taken from the corner of Westervelt Avenue, shows some of the homes on Corson Avenue as they look today. 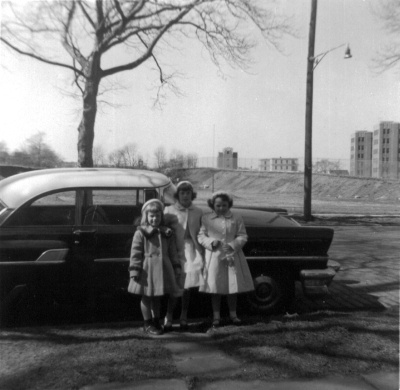 During the 1960s, my mother and I lived on the top floor of the tan building (I think it was 80 Corson Ave), and the bottom floor of the building at the far right (431 Westervelt). 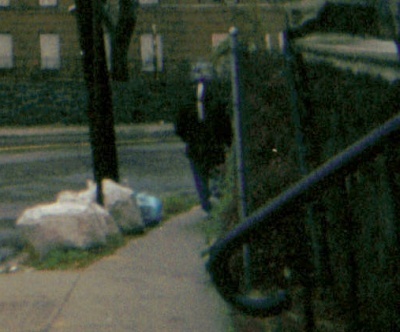 In the background, new houses can be seen on Victory Hill. 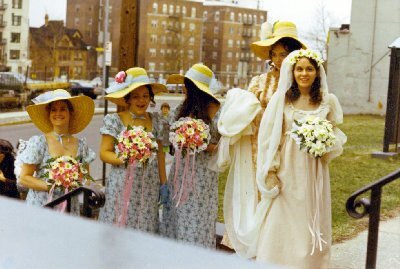 Taken in 1970, this photo recalls a friend's wedding at the historic Brighton Heights Reformed Church in St. George. 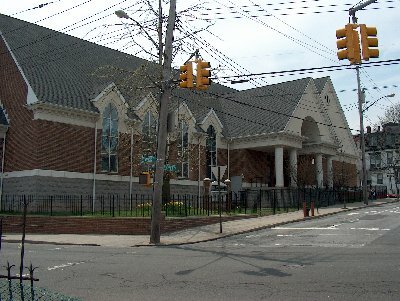 (Although the original structure was destroyed in 1996 by a tragic fire, the church has since been rebuilt.) I am the second from left. The street behind us is St. Marks Place. The apartment buildings in the background are on Central Avenue. On the steps of the Brighton Heights Reformed Church. The three bridesmaids on St. Marks Place. We are across the street from the side of the St. George Theater. For many years, my grandfather was a projectionist there. 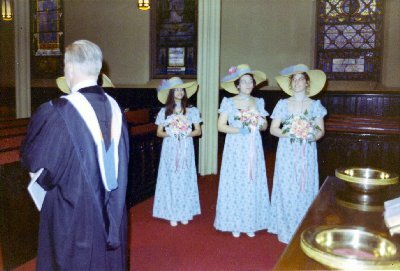 These two photos show the bridal party inside the sanctuary of the old Brighton Heights Reformed Church with the Rev. Stanley Verhey. Bride, groom and maid of honor, leaving the church after the ceremony. Brighton Heights Reformed Church today, rebuilt and still a vital place of worship. 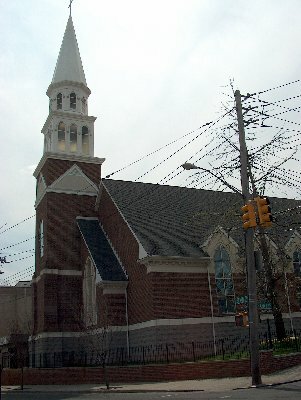 As a child I attended this church and sang in the children's choir. We were directed by Miss Blanche and always participated in the beautiful Christmas Eve services. The children's choir would file into the sanctuary, then proceed down the aisle holding candles and singing carols. We accompanied the adult choir, who sang from the organ loft. Miss Blanche, I believe, also played the organ. 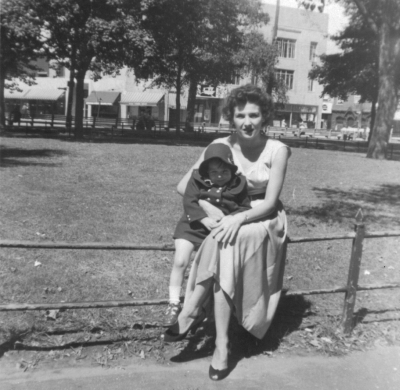 My mother graduated from Curtis High School and went to Hunter College in the city for her teaching degree. Her parents had come from the old country so she was the first family member to get a degree. 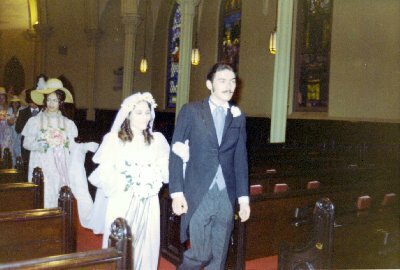 Her maiden name was Helen Louise Sullivan and she married my father John F. Marrinan who was a Homicide detective at the 120th Precinct in St. George. He had started out as a mounted cop there. 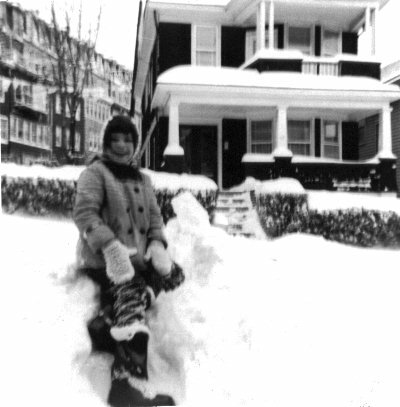 Her family had lived on Hendricks Ave. before my grandfather built the place on Daniel Low with the upstairs for my grandparents and the downstairs for my mother, father and myself. My mother taught eighth grade at P.S. 16 but sadly she had to go on sabbatical and we took her to Florida. 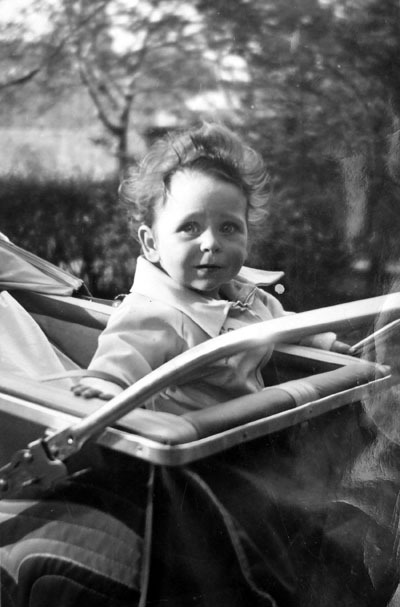 She passed on in 1935 in St. Petersburg when she was only 35 years old. I wonder if the old structure at P.S. 16 still stands? I learned the Roman numerals from its big clock. Some of the other teachers there were Miss Loeffler, Mrs. Addy and Miss Alice Olson. I too used to walk down to Bay Street and on to Stapleton to go to the movies or go to F.W. Woolworth's. 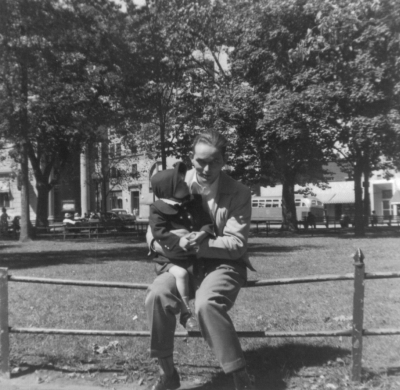 I used to sit in Tappen Park on a nice summer day too. 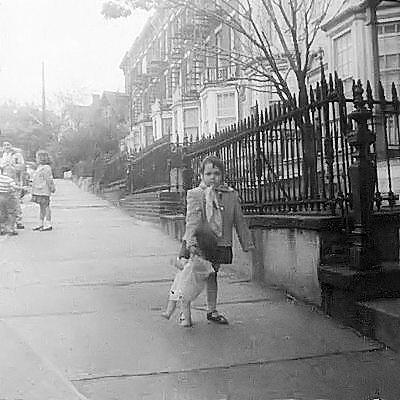 My cousin lived on Brewster Street off Van Duzer and I often visited there. When we lived at 137 Daniel Low Terrace there was a big lot with trees next to Fort Place where once a mansion had stood. 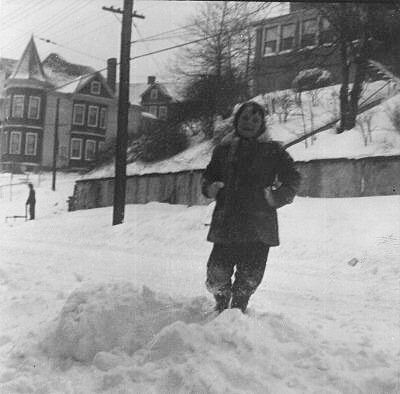 I used to sled down the hill next to our house. I had friends named Jensen who lived in the brick building at the corner of Victory Blvd. 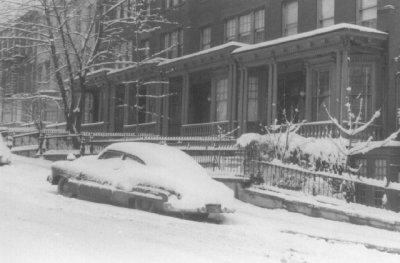 and St. Mark's Place in the 1940s. 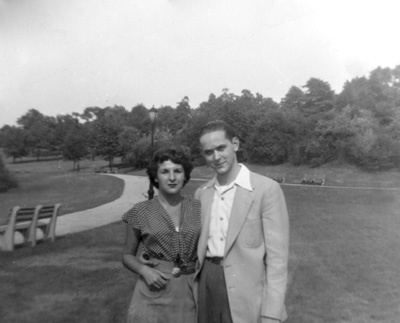 My parents at Silver Lake Park circa 1950. 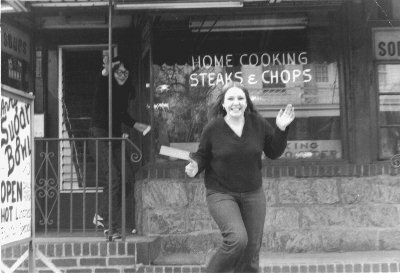 Me and my friend Linda coming out of Ann's Sugar Bowl in the late 1960s. on a Sunday because the St. George parking lot behind me is empty. its curbs. That would be a rare sight today. A friend and I at the same location. This was taken across the street from Curtis High School, where there was a group of abandoned buildings. They have long since been replaced by a highrise, but I have always been curious about the old buildings. Muriel Dandurand, 82, remembers a fancy hotel on this site which was later razed to put up these homes. They were in good shape during her youth. 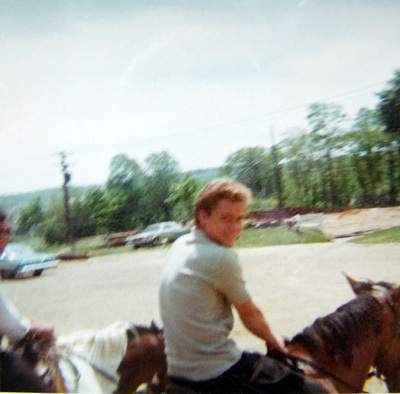 A friend enjoying a ride at Clove Lake Stables in 1967. 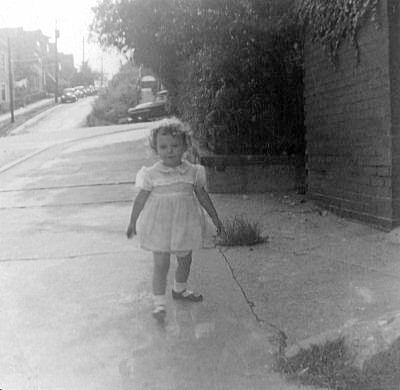 I think the photo was taken in front of the stables looking toward Clove Road. But it is hard to tell, because the stables have been torn down and the area is now crammed full of buildings. 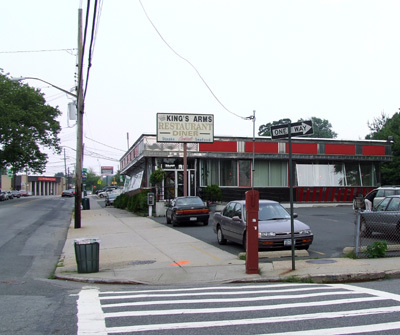 The King's Arms Restaurant on Forest Avenue as it looks today. I remember this as a popular teenage hangout during the 1960s. 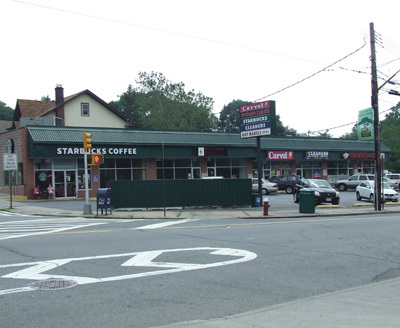 Anyone remember the old Carvel besides the King's Arms? It was once the only building on that lot. Although the old Carvel is gone the business survived as part of a strip mall at the same location. Recent photos of the now-abandoned Staten Island Hospital on Castleton Avenue. I once worked in the medical records department. Hazel H. Brown was the supervisor and Craig Taylor was her assistant. At the far right of these photos, part of the older hospital can be seen. At right is a detail from the photo above. My husband insisted that there was a headless man in the picture. Perhaps a resident of the abandoned old hospital. What do you think? The once-popular Paramount Theater has seen better days. 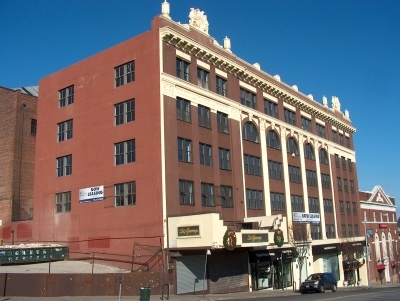 The old Victory Theater as it looks today. Once in decline, the historic St. George Theatre was restored by Rosemary Cappozalo and her daughters, and now serves as a major cultural center. 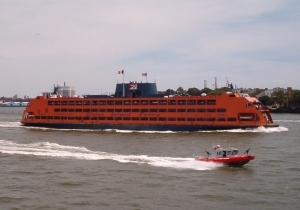 If you want to keep your finger on the pulse of Staten Island, stay in touch through SIChat. Guess what. Twice we have been in need of emergency auto repairs while visiting my mother on Staten Island. 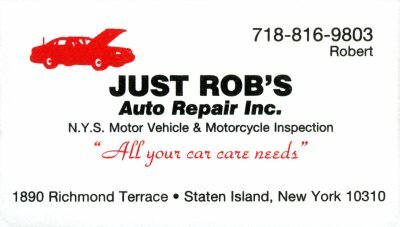 Islanders know about his auto repair shop.